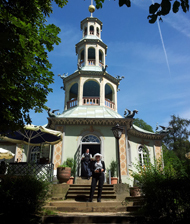 A stroll around Sanssouci Palace and Park while the sun is shining is hard to beat. And no wonder, as it was the summer residence of Prussian Kings and German Emperors. Potsdam is literally crammed full with gorgeous palaces. The Cecilienhof Palace, where the Potsdam Conference was held was where the four power agreement was ratified after WWII, dividing the city for the next 44 years. The Marble Palace, the “New” Palace, built 1763-1769, the Potsdam City Palace… you get the idea. There’s a couple of nice gates (like the “other” Brandenburg Gate), a few beautiful churches, and a little bridge with a touch of Cold War history. Potsdam even has a small Russian settlement, Alexandrowka, and a Dutch quarter! There is no shortage of quaint local cafés and pubs either for a refreshing break. A by-the-book tour of Potsdam can be done in 3 1/2 to 4 hours, (5 hours if you include the train ride to and fro), but it can easily go longer if we’re relaxing, exploring and just having fun.